Hi Everyone, I just wanted to share a recent interview I took part in. :: How did you get your start in photography? Were landscape and nature always your first subject matter? I had always been interested in different kinds of art and photography as a kid, it was sort of a random hobby that was never taken too seriously. I played around in the dark room in high school and worked at a one-hour photo booth shortly afterward and it was interesting, so I didn’t really think I was learning while I was busy having fun with it. My first plane trip was over the Sierra to visit my parents that lived near Lake Tahoe. Seeing how much wilderness was out there had me floored, but the views from the jet window were just too short and too fast. Eagerly I drove out there to see them again very soon. Once you see your first sierra alpen glow you’re hooked. At the time I was working as a sales assistant so I had a lot of people I could show vacation photos to and surprisingly they wanted to buy them, so I became a sort of a picture peddler. The only problem was, the photos were shot with plastic throw away cameras. Too bad I couldn’t afford a nice camera at the time, but the desire and passion was born! Months later, I was helping some friends move one day. There was an old OM2 Olympus camera just sitting there in the garage full of dust and nobody packed it up. I asked if I could have the camera and after arguing with another friend over it, they gave it to me. Eventually I shot a wedding so I could buy a digital camera to better experiment with. The learning curve went so much faster, so I embraced digital photography. Instantly I became a weekend warrior with a camera in hand, eager to leave on a Friday afternoon and not return until the late hours of Sunday evening. My work from my first digital year was featured in the Show Case section of Outdoor Photographer Magazine three separate times in one year. There are very few photographers that OP has done this for and for those who have, they have been very well known for decades. This created some pressure for me to only create a certain type of image and made me realize I can’t be myself unless I experiment constantly with new forms of landscape photography. :: Living near Los Angeles, what are your favorite local spots to go out and photograph? 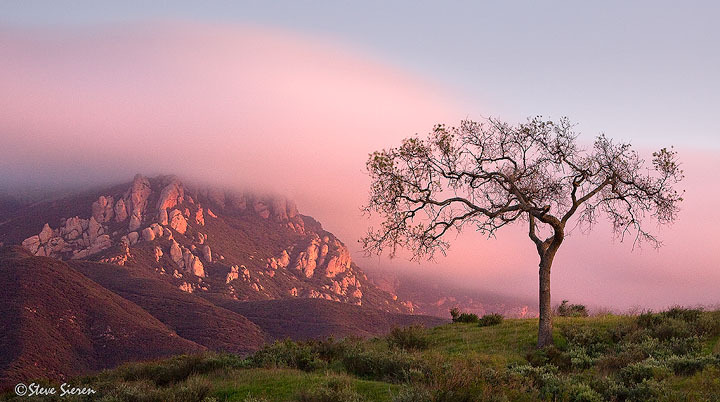 Close to home I’ve got the Santa Monica Mountains with their mediterranean climate full of old volcanic rock formations, oak hillsides and rocky beaches. You can find seasonal waterfalls scattered around the Santa Monicas. This sort of California ecosystem doesn’t exist in the rest of North America and most photographers take it for granted and only photograph its beaches, so it’s often less crowded than the popular California Coast. :: Do you ever try more urban type landscape photography? I’m an active urban landscape photographer, I enjoy composing modern and old architecture. Some of my income comes from architectural photography. You can come across some interesting people when in the urban parts of Los Angeles, it’s an opportunity for photography I wouldn’t pass up. Some of the places down there can be a little rough at times, so I’d recommend to others going with a group. It can make it safer and if you don’t have a group at least try to blend in; use something other than an obvious camera bag and photo vest. I’m not saying buy a sombrero and a pancho, but maybe be a good samaritan and swap jackets with a homeless person that could use new one. 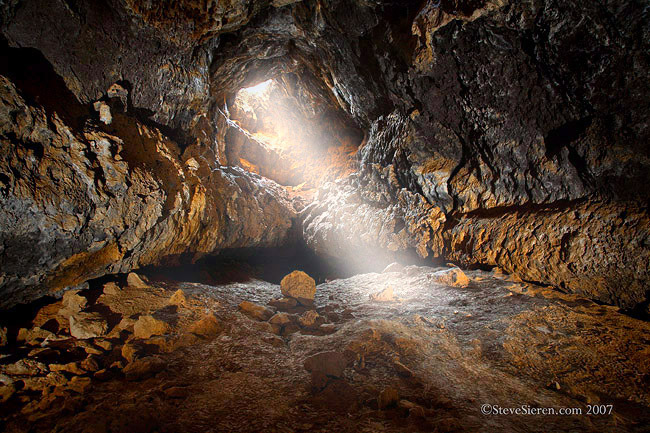 :: What was your scariest or worst day as a landscape and nature photographer? I’ve had couple of days that were pretty scary, once down off the East Cape of Baja after coming back from a sunrise shoot I crossed some land where squatters were attempting to claim a section of beach, their dogs chased me out into the water. I didn’t have the chance to explain myself until after the fact. I’ve been trapped by the tide in the tidal zones and had to wait it out my fare share of times, but the time I should have been scared the most was a couple of climbing trips up Mt. Agassiz. 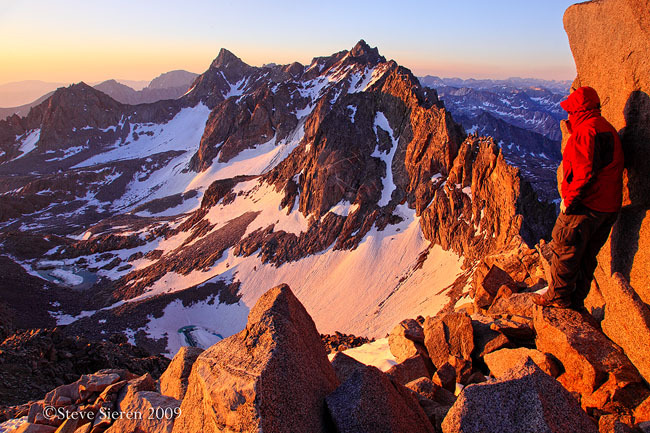 It’s respectfully one of the Sierra’s tallest peaks with many 14,000 footers in the distance on the same ridge. The first time up I tried about 3 hours before sunrise and I didn’t summit in time because I couldn’t see the route clearly from the bottom. I was in the wrong place too many times and in need of climbing gear. A few days later, while I was sitting at home processing images from the trip days before, I got the wild idea I could summit the mountain that afternoon. By sunset I was on the mountain and only had another 1,000 feet to go. The moderate scramble in daylight increased to more bouldering in the darkness than I had thought. There is a picture stuck in my head from that evening and it’s from every time there was an exposed portion of the climb I had to look down and see how far the fall would have been. I can still hear the scree falling and snowmelt flowing down the gully on the route up. It was all worth the sunrise view at the top and of course it would be a lot easier to do all in daylight but then I wouldn’t be talking about the experience. :: What is the most difficult image you’ve made, and what made it so difficult? My most difficult image I’ve made was Life’s Grip. It’s a seascape image where I had to drop the tripod and quickly compose an image in between waves in low light. 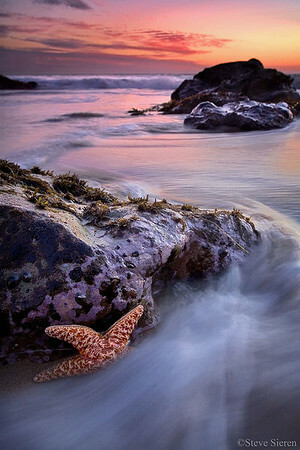 The tide was low and I wanted the starfish to be dramatic in the composition. The first few tries had the camera soaked and there was too much shake from the rushing water so I opened up the aperture and bumped up the ISO to shorten the exposure. I sacrificed some depth of field but the main subject is tact sharp and the rushing water in the shape of an S curve leads the viewer off into the decorative sunset in the background. It was a difficult decision to decide if it should be shown or not. The rules were broken and the technical aspects were off slightly but the image has still been published and sold as a fine art print. When it comes to ocean photography, if you’re scared to get wet, you don’t belong at the ocean. :: Outside of Southern California, where is your favorite spot for photography? Why? Death Valley, it’s the largest National Park outside of Alaska. The geology is just so vast and unique in so many different parts of the park, the multiple dune fields, badlands, unique formation in the salt flats. There are so many hikes and car spots that haven’t been “iconized” yet. I’ve seen a lot of these spots here but the park is so big I haven’t seen half of it yet in all the trips I’ve made there. 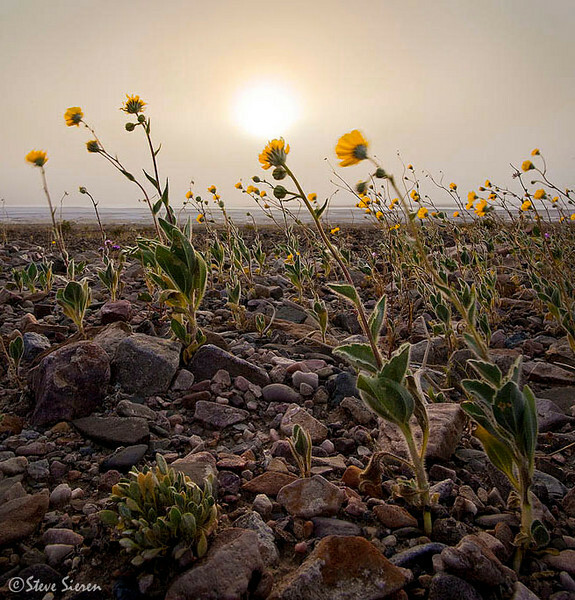 You can find dunes full of wildflowers, giant sand storms, blooming orchids in the spring, flooded salt flats and cacti covered in snow. It’s a land of extremes and you can spend a life time exploring it’s many canyons and valleys. :: What do you find challenges you the most with your photography these days? The most challenging thing for me right now is finding new ways to photograph old subjects. Changing the perspective of the familiar icons and finding other new locations that might interest other photographers is a continuing challenge. I’m cautious in providing information on certain locations because of the impact large crowds may have to the local environment. It’s always disappointing being denied access to a location due to permit restrictions, but it’s a necessity for all fragile environments. I think California will have some of these types of locations just like the Southwest – many of them. :: What was the best piece of advice anyone ever gave you (or you read) that has helped shape you as a photographer, and what would be the piece of advice you would pass on to a new photographer? It was from Jack Dykinga. He said a couple of things, first, people don’t tell it like it is nowadays, and second, keep a couple of twenties in your shirt pocket when driving in Mexico. If I were to give any new photographers any advice, it would be, study the work of others you admire. I don’t recommend copying them, but I see it done so often; it’s a form of learning, so once you get good at that move on and develop your own style, become yourself again and enjoy exercising your own creativity! We’re in an interesting time where some of us know about what landscape photography was like before the digital revolution and Internet changed the faces of landscape photography. :: Your website mentions you’re working on a couple of book projects; how are those going? I’ve been working on a book, I guess it could be done in a few separate books, but it’s a lot more work than I thought it would be, so it hasn’t been finished yet. I had to modify the book completely when I had news there was something very similar being worked on. In the middle of the book I became curious if it would be profitable or not and that kind of slowed things down and it’s all back up to speed. It’s turning out better then I had anticipated. :: Do you have any personal shoots coming up you’d like to share with us, or projects you’ll be undertaking in the next few months? I’ve been working on much of the Mojave Desert’s unpopular areas and there is really some fantastic stuff out there highly worth photographing. I’ve also been working with an ecotourism company for the Islands of Baja California to bring awareness and help protect the islands for future generations. For the most part, I try to keep the spontaneity alive so who knows where I may end up next or what I’ll be working on; I have lots of love for California! This entry was posted on April 20, 2011 at 8:24 pm and is filed under Uncategorized. You can follow any responses to this entry through the RSS 2.0 feed. You can leave a response, or trackback from your own site. You are a fabulous photographer and this is quite an accomplishment. Congrats. Interesting and funny. And some good tips. Thanks all, I appreciate the comments!